Fifty-five years ago today, Wayne Francis Woodard, better known as "Hannes Bok," died in poverty. He was friends with, and had his work admired by, the likes of Ray Bradbury, A. Merritt, August Derleth, Farnsworth Wright and others. I must confess that I've always been ambivalent about Bok's art. While I find some of his work truly excellent, I consider much of it average or even poor. Bok, while obviously talented and proficient, tended toward overstylization and surrealism, in my opinion. Stylization and surrealism aren't deal-breakers for me, but they have to be handled correctly and I don't think Bok pulled that off in many instances. His art also tended to be somewhat precious and fey at times, as in the case of his cover painting for Skull-Face and Others, which I consider inaccurate and misleading, notwithstanding whatever artistic merit it may possess. It does not capture the spirit of the poetry and prose within. Your mileage may vary. However, I am not here to list Bok's failures, but to laud his shining triumph. 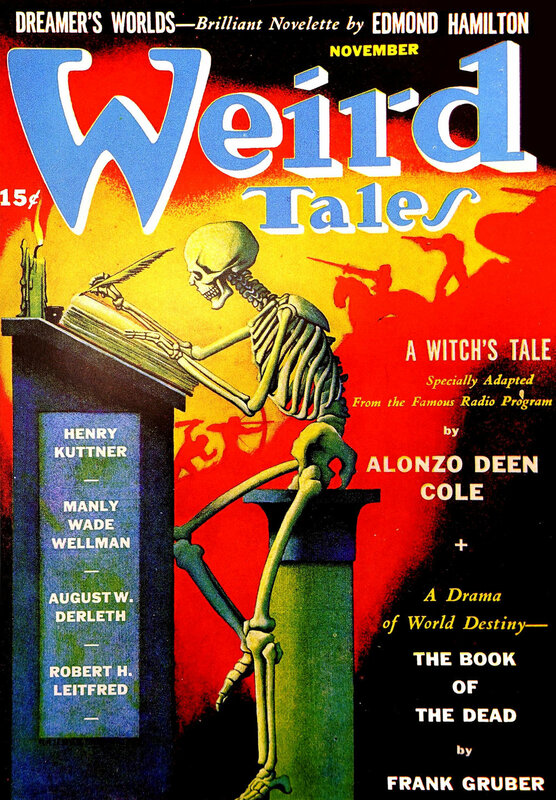 That would be his cover painting for the November 1941 issue of Weird Tales. When I first saw it reproduced years ago as a book cover, I was struck by just how perfect it was as a Weird Tales cover. In the background, there are silhouettes of a club-wielding caveman, an archer, a knight, a rifleman and a tank. The technological progression of human aggression from left to right, cloaked in a blood-red haze. In front of them is a seated skeleton, quill in hand, inscribing tales of blood and horror by the light of a candle. That painting could've been put on the front of any issue of Weird Tales from March 1923 to September 1954 and been just as perfect. Some Gentle Readers of the DMR Blog may not realize that Weird Tales didn't just publish "pulp horror" by the likes of H.P. Lovecraft and Seabury Quinn, or that the Conan tales by Howard weren't the only example of "adventure" fiction that the Unique Magazine purveyed to its audience. The first Conan yarn appeared in an issue where the cover story was a sword-and-planet tale by Otis Adelbert Kline. WT also published space opera stories by Edmond Hamilton. Farnsworth Wright bought (weird) Western tales from Robert E. Howard. In many ways, the "uniqueness" of Weird Tales lay in its policy of only publishing stories with a "weird"--i.e., SFF or horror--element. Otherwise, it wasn't that different from Argosy. That wide range in content is what makes Bok's painting so perfect as a Weird Tales cover. Within that simple, incredibly well-composed image, virtually everything Weird Tales published is covered to one extent or another. I'm not the only one to think so, since the editors--or at least, the art department--of the absolute best Weird Tales collection published to date, Weird Tales: 32 Unearthed Terrors, thought so as well.